If you're not lucky enough to have a large pasture or lawn to use as an airstrip, you'll need a way to get your PPC from here to there. 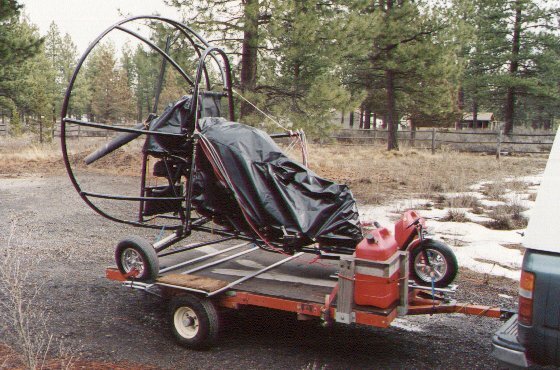 The trailer I use was built for about $250.00 complete, and does the job well. Note that the measurements below are for the Six Chuter SR7. Other models will require adjustments. Click on an image for a larger version. The trailer starts with one of those ubiquitous $199.00 discount store trailers. I bought this one at Fred Meyer in Oregon, and understand that many other stores sell them. 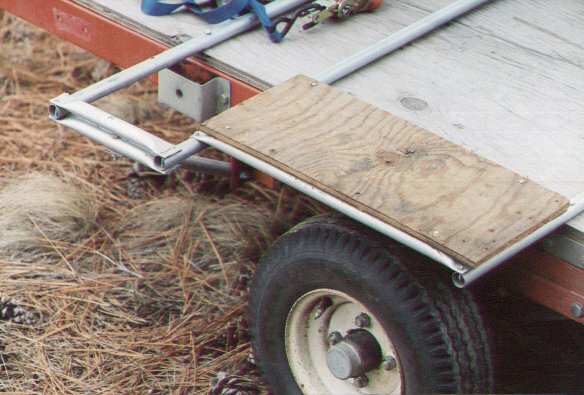 You'll find them advertised as "4 X 8 folding utility trailer"
The trailer is a bolt together kit that comes complete with lights. You have to supply the 3/4 inch plywood bed yourself. Gross weight is 990 lb., plenty for a PPC and accessories. 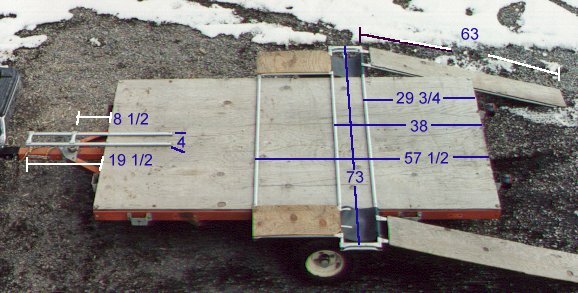 By adding a structure built of 3/4 inch thin wall conduit, this trailer will support a PPC securely. Click this image to get a larger photo with measurements. The ramps are two pieces of conduit screwed to a piece of 3/8 inch plywood. This image shows details of the nose wheel mount. 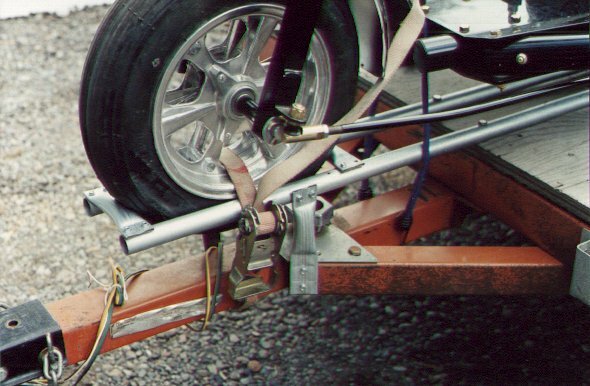 Note the ratcheting strap that holds the wheel in place. 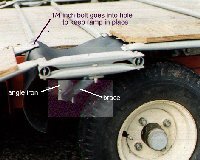 A similar strap holds the main landing gear. This image shows the support for the main landing gear holding structure. Note that nylock nuts are used throughout to avoid crushing the conduit. The other fasteners are 1/8 inch hex head self drilling/self tapping sheet metal screws.